Start with the basic do’s and don’ts for posture. Improve your posture with exercises from the Army Field Manual. Fix your posture with three exercises against a wall. Get into proper posture at your desk with two simple body adjustments. Improve your posture and build balance with a daily warm-up. A guide to stretches that help fix posture problems. Fix your computer hunch and other posture problems in 30 seconds. If you’re a desk jockey, you might get the most posture improvement from setting up your workstation properly. Figure out the ideal desk height, whether sitting or standing, nd keep your feet flat on the floor when sitting (an easy way to find the right seat high is to level it with your knees). Here is Lifehackers complete guide to setting up an ergonomic workspace. Constantly craning your neck down to stare at our phones isn’t helping. Try holding your phone straight in front of you instead of bending your head down. Try propping your tablet up perpendicular to the table if you’re just reading. Nekoze is a cute app that uses your Mac’s camera to keep an eye on your posture—a cat (icon) will warn you when you’re slouching. There are other posture trainers for iOS and Android. If you’re not into apps using your camera, build your own posture sensor for your chair. How we breathe can deeply affect how we move and how we feel. Learn to breathe more effectively, using your diaphragm. Try breathing exercises that focus on lengthening your spine and engaging your waist muscles and lower core muscles. Sit up straight when driving. The type of pillow we use and the type of mattress we sleep on will affect how we hold ourselves during the day. Adjust the height of your counters in your kitchen to keep from hunching over. Sitting at a 135-degree angle could put less strain on your spine. Make sure you’ve got a good chair that supports your back and is ergonomic for your workspace. 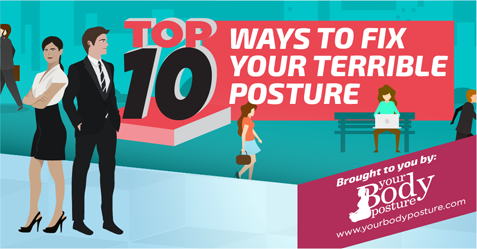 If you find it difficult to maintain sitting posture, consider using a posture correcting brace (A). Exercises that strengthen your core will help you stand taller and help you maintain the proper posture. Emphasize body awareness and balance—and you can work up to some pretty impressive poses. Pilates and any other exercises that focus on your core will help with your posture too. Take a photo and compare to this illustration. Become more aware of your feet when you’re standing -Adjusting your weight evenly across both feet. Test your basic mobility and core strength. Focuses on measuring your balance. It keeps you moving every day. Helps center posture with balancing strength and Flexibility (B). Helps change the brain to improve balance (C). Bad or terrible posture can lead to aches and pains in the back, neck, and shoulders. Headaches and tension in the shoulders and back are often created by chronic bad posture.